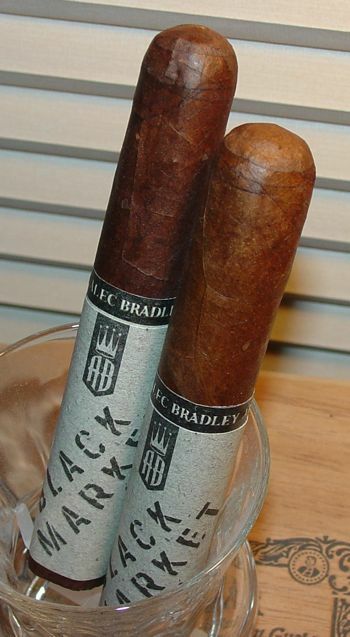 In the wake of critical hits like Prensado and the Family Blend, the folks at Alec Bradley might be expected to kick back and bask in the glow of their well-deserved success. But that’s not what they’re doing. They’re back at work, inventing new cigars like the Fine and Rare (a blend of 10 different tobacco leaves) and this one, the Black Market. “New” is a relative term, of course. These cigars were released last year, before Prensado took home the gold in the Cigar Aficionado rankings at the beginning of this year. Even so, I don’t think these guys are going to be sitting around on their laurels too long. The Black Market is an unusual looking cigar from the start: it doesn’t appear to have a band. 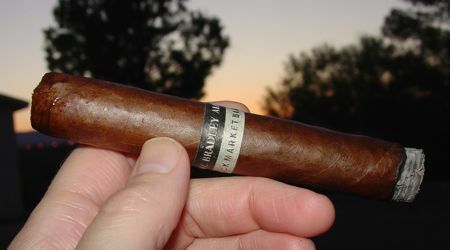 A gray sleeve covers the lower part of the cigar. When removed it reveals a standard size cigar band positioned in the middle of the stick. This is distinctive and appealing, but it raises fears that it might not be easily removed. I was pleased to find that the wrapper is smooth enough and the band is glued with enough care that it slides easily toward the head of the cigar. The Black Market is also a little unusual under the hood: this cigar is composed entirely of viso and ligero leaves. Usually a blend contains at least some seco leaf for balance and aroma, but not this one. Slipping the sleeve from the shank of the cigar reveals a glossy dark colorado wrapper, so dark that it is almost maduro in shade. The leaf is a little veiny, but the oiliness of the leaf compensates for this minor detraction. The head is round and finished with a triple cap. The roll is quite firm but the draw is good, and it burns evenly from first light to last ash. Which is smooth and solid, by the way. The first flavors to emerge from the Black Market Robusto are the sweet woody notes of Aganorsa tobacco. I don’t know if that’s what this wrapper is, but if I had to guess, that’s what I’d say. What differentiates this cigar from the many other cigars utilizing this ever popular leaf is the lack of pepper. There is very little sharpness here. I wouldn’t go so far as to call the taste “round,” but the flavors are smooth, balanced, and distinguished enough that the pepper is not missed. Mild coffee and chocolate flavors add to the mix after half an inch or so. The cigar’s body is decidedly in the medium range, remaining smooth and quite easy to smoke. The chocolate flavors are tempered a bit in the mid-section, leveling out to cocoa, with a touch of earthiness edging its way in. The aftertaste is clean and light. The final section is a little more concentrated as the cocoa veers toward caramel and the earth becomes more pronounced. The aroma remains sweet and woody, and the cigar winds down with just a touch of char. 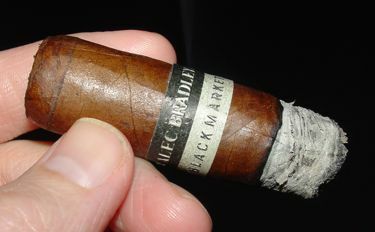 Alec Bradley’s Black Market Robusto is an unusual and intriguing blend because it offers many of the flavors associated with popular Nicaraguan-style cigars without the aggressive bite and acidity that affects so many of them. I’m curious if the seco-less composition has anything to do with this, or if it’s the Panamanian wild card. Whatever it is, this is a smooth and flavorful cigar. The flavors don’t transition too much, but the cigar is perfectly charming the way it is. The complex blend of sweet wood, coffee, and earthiness is enough to sustain the medium-bodied cigar smoker’s interest for 45 to 60 very pleasurable minutes. The MSRP is around $6-7 USD for the robusto, a pretty reasonable deal all around. I’ve read differing viewpoints on this cigar, and it’s gotten to the point where I’m just going to have to try it for myself. While I do like a peppery or spicy cigar, I don’t always find it necessary to have that quality. For me, balance of flavor (and strength) is key. By the way, it’s partly due to your previous review that I decided to give the American Classic a shot and just ordered a handful. I really like AB’s versatility — the American Blend is a much different style of cigar, but I hope you enjoy it. I hate to think I’m leading anyone astray! Sorry about the money part. I haven’t figured out a way around that one yet. 🙂 But at the very least I think the American Blend is a good value cigar. Tom, I purchased this stick, and some American Classic Blends (plus a Prensado which my boss stole from me) when the AB rep was at my local tobacconist’s. I am very excited to put flame to this one and look forward to your upcoming reviews. Glad I found your site. Add a Family Blend and you have all of my AB favorites right there. Enjoy ’em, and let me know what you think! So last Saturday I was able to toast and enjoy the Black Market Robusto, I think I missed out on a lot of enjoyment by where I smoked but none the less will purchase this stick again. The wind at the top of Independence Pass (12K+ feet above sea level) was not conducive to really enjoying the smoke, so I guess I’m off to the tobacconist for another! Have you or anyone ever tried the cigar samplers sold by Thompson Cigar? Are they any good? I would recommend that you take a look at Cigar Inspector’s Shop review on Thompson: http://www.cigarinspector.com/thompson-cigar My experience with them was of the thumbs-down variety, but you may have better luck. Regarding the “deal-a-day” sampler, keep in mind that you’re getting what you pay for. Or possibly less. Very likely much less; house brand dog rockets. But you would get the added bonus of spam and endless sales calls. I’ve been tempted to try one of their packs, but after reading the reviews I will steer clear of Thompson. I prefer my local shop, but I have bought once from Cigarbid with good results. Funny that the person asking about Thompson is selling them…. It appears to be advertising without permission, so my first thought was to delete the comment. But it gave me a chance to plug Cigar Inspector’s shop review section, which is a great resource, so I let it stand. Haha, yes the result may not be what that person was fishing for. And you’re right, Cigar Inspector’s Shop Review section is a great resource. Your review on the Black Market is dead on. I got a dark chocolate and coffee taste with a little woodiness too. Medium flavor\body with a smooth rich finish. I love the oily wrapper. Just because it’s medium doesn’t mean it does not have tons of flavor. It has plenty but none of the flavors are overpowering. I have had all sizes and find they are consistent in each one. One of my new favorites. BTW-love the blog. This cigar is somewhat hyped in germany currently! I’ve not had the chance to try it yet, but if I get the chance son, I definitely will! the critics are quite positive I think. But what do you expect regarding long term storage? Do you guys think it’s worth putting a box or two into the humidor and wait for some time? Thanks for this review! I agree with your review, nice cigar very enjoyable smoke, way better and cheaper than some middle of the pack cubans. The only somewhat negative point was the uneven burn… It is available here in Toronto for about $12.